Sen. Kamala Harris (D., Calif.) earned "Four Pinocchios" from the Washington Post Wednesday for a claim it described as "nonsensical and misleading." Harris took a shot at President Donald Trump's tax reform Monday, claiming it was hurting the average American and the middle class. "The average tax refund is down about $170 compared to last year," she wrote. "Let’s call the President’s tax cut what it is: a middle-class tax hike to line the pockets of already wealthy corporations and the 1%." The tweet described the decrease in the "average tax refund" as bad for Americans. Harris based her claim on one week of early filing data from the Internal Revenue Service. The refund is the amount the IRS determines it withheld from a taxpayer's income in excess of the amount the taxpayer owed. That money gets returned at the end of the year. In effect, the government only returns at the end of the year income to which it was not entitled. That is money individuals could have used to make investments or pay off loans. "Ideally, you should end up with no refund or tax due," the Post‘s fact-checker Glenn Kessler wrote. In addition, a year-over-year change in refunds is an inefficient indicator of how the tax system has changed. The tax law required the IRS to change tax withholding tables. The IRS encouraged Americans to review and update their W-4 forms to make sure the right amount was being withheld from their paychecks but a survey by H&R Block indicated that 80 percent of Americans failed to do so. In other words, if you left everything just the same, you can’t expect the same result. The new tax law raised the standard deduction but also eliminated personal and dependent tax exemptions. While the law reduced tax rates, it also capped a deduction for state, local and real estate taxes, which could really mess up a person’s tax situation, especially if they live in a state with high taxes such as California, New York and New Jersey. 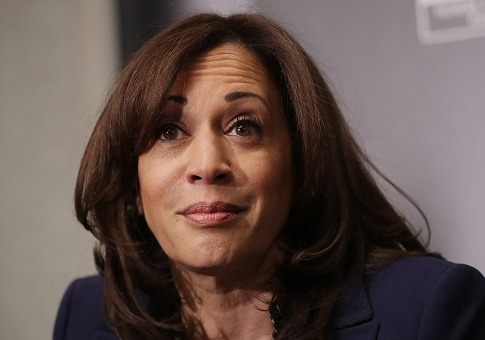 Harris, who is running for president in 2020, presented the decreased refund as a negative, and as something that favors the highest earners. Inasmuch as a reduction in income taxes saves the most for those who earn the most, Harris's claim is true. Currently, upper-class earners pay the vast majority of the country's income taxes. Harris claimed, however, that the tax cut includes a "middle-class tax hike." The Post cites the Tax Policy Center, which estimated that 19 in 20 Americans would not see their taxes go up. Per the report, ninety percent of the middle fifth of Americans by income—roughly the heart of the middle class—would get a tax cut. Contrary to Harris's claim, "in 2018, the vast majority of middle-class Americans can expect to pay less in taxes as a result of the Trump tax law," the Post said. For all her concerns about not raising taxes on working Americans, Harris supports the "Green New Deal," which would cost trillions of dollars. According to a document about the deal released by its champion in the House, Rep. Alexandria Ocasio-Cortez (D., N.Y.), the radical environmental proposal would seek to eliminate curb cow farts and eliminate regular air travel, two things middle class Americans currently use. Ocasio-Cortez's office disavowed the FAQ document several hours after putting it on her website. A spokesman for Harris claimed the tweet was about the "long-term effect" of Trump's tax reform. The individual tax cuts last ten years, at which time Congress is expected to extend the rates. Democrats, therefore, use 2027 tax estimates to present the worst possible case to taxpayers and voters. Ian Sams claimed that "[t]he tweet makes a couple assertions with a limited number of characters." According to the Post, he "did not answer a question about the income level that Harris considered ‘middle-class,'" a term she used in her tweet. For mixing facts in a "highly misleading package," making a "probably unrealistic assumption," and offering no "nuance or qualification," Kessler awarded Harris Four Pinocchios. This entry was posted in Politics and tagged Kamala Harris, Tax Reform, The Washington Post. Bookmark the permalink.